Inspired by the 20th century designs of the late iconic luxury furniture maker, Karl Springer, this snakeskin wrapped petite telephone table is in a class by itself. Original Karl Springer furniture, known for its combination of rare woods and exotic materials, is nearly impossible to find. 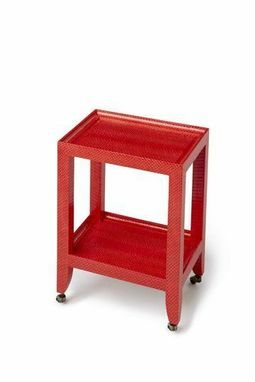 But by teaming with a former Springer artisan I have created a table embodying the highest quality materials and workmanship that marked Springer's original furniture. 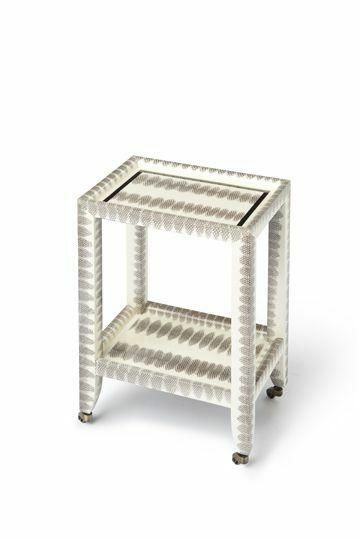 This one-of-a-kind table features genuine sea snakeskin in a dramatic white with black pattern. The underside of table and shelf are lined with felt. The snakeskin on this table has been lacquered with multiple coats of high gloss clear lacquer, which adds both beauty and protection. Size of table measures 12 ½" wide x 9" deep x 17" tall. Antique brass casters complete the look of this table.